The US House of Representatives could vote tomorrow on whether to eliminate privacy rules that would have forced ISPs to get your consent before selling Web browsing history and app usage history to advertisers. The Senate voted to kill the rules on Thursday, so all that’s left are decisions by the House and President Donald Trump. House Majority Leader Kevin McCarthy (R-Calif.) placed the legislation on the schedule for Tuesday. Legislative business is scheduled to begin at noon. The legislation is S.J. Res. 34, a resolution invoking the Congressional Review Act in order to invalidate the Federal Communications Commission’s privacy rules and prevent the FCC from issuing similar regulations in the future. The Senate vote was 50-48, with Republicans voting to kill the privacy rules and Democrats voting to preserve them. Lawmakers in the Republican-controlled House will also likely vote mostly along party lines, but privacy rule supporters urge residents to contact their legislators before the vote. 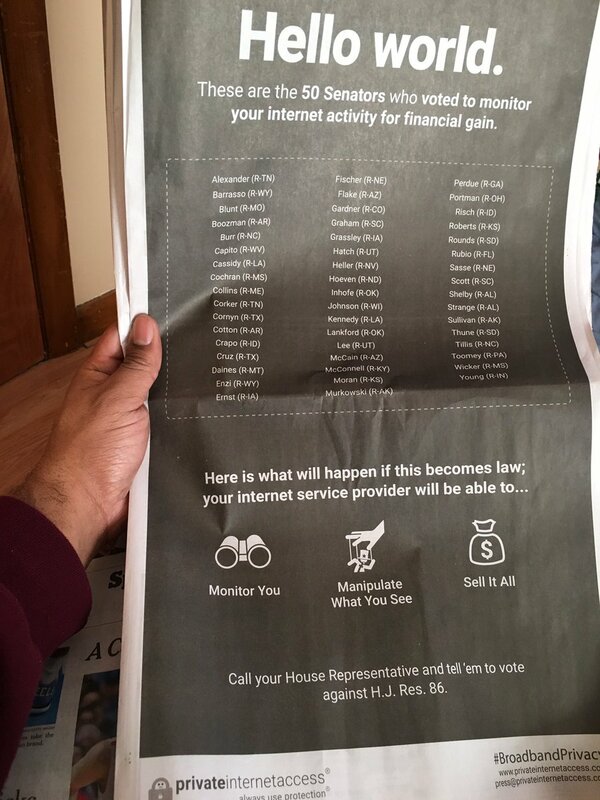 “We are one vote away from a world where your ISP can track your every move online and sell that information to the highest bidder. Call your lawmakers now and tell them to protect federal online privacy rules,” the Electronic Frontier Foundation said. You can also figure out who your representative is on the House’s website. The resolution is being taken up tonight at 5pm ET by the House Rules Committee, which will presumably send it along for a full vote by the House tomorrow.